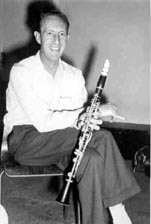 Clarinettist David Watt Paxton was born on April 16,1926 and attended Portobello School and Edinburgh’s Royal High Schools. He left the R.H.S. at age 15 to take a course at Leith Nautical College which gave him the necessary qualifications for entry to the R.A.F. which he joined as an aircraft apprentice in 1942. While passing all the Selection Tests, due to eye problems his ambition of making aircrew was not to be realised, but he went on to serve four years with the R.A.F. leaving in 1948 to return to Edinburgh. After a short period as an insurance clerk with Eagle Star, he went to the Persian Gulf as an employee in the Oil Operations Department of the Bahrain Petroleum Co. where he remained for about 15 years, including a year in Italy and another in Lebanon. As a 'Stillman', his job was to commission new refineries and train local personnel to operate them. He returned again to Edinburgh in 1966 and became a salesman of electronic calculators for some eight years until, as the result of a company take-over, he was made redundant. By now 48 years of age, finding new employment was difficult, but he did manage to find work with Scottish Gas in a clerical capacity. Married to Jeanette, he had two daughters (Philippa and Stephanie) and a son, Craig. 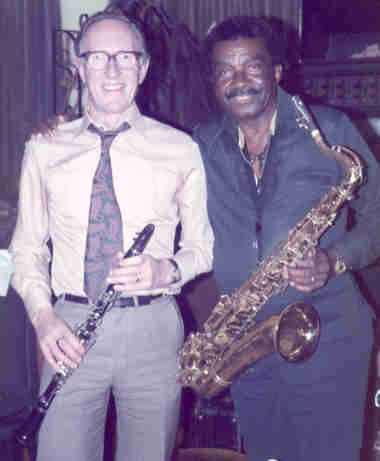 Dave played regularly with Sandy Brown/ Al Fairweather and others at the Edinburgh Jazz Club (previously Rhythm Club) meetings in Riego Street, often duetting with Sandy, before his spell in the Persian Gulf where he played clarinet in a group of Oil Company colleagues. 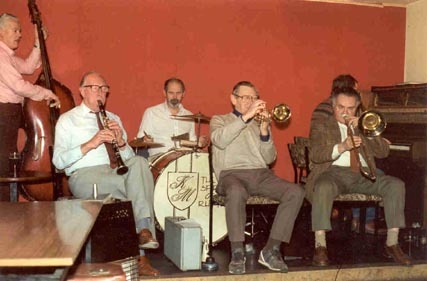 On returning to Edinburgh in 1966, he formed the Dave Paxton Jazz Band before becoming a member of Bill Salmond's Louisiana Jazz Band for some 17 years. He also played alongside Bob Craig who had remained in Edinburgh when Sandy Brown and Al Fairweather moved south to London. 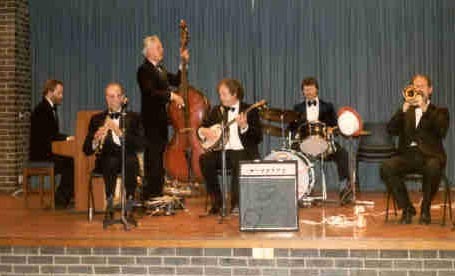 [In January 2014, Laurence MacDonald wrote to Sandy Brown Jazz to say: 'I have some very good quality live recordings that a friend and I made in the 1980's of: Louisiana Ragtime Band (wit Dave Paxton), The Gumbo Jazz Band (nearly the same lineup as Spirits Of Rhythm? ), The Pete Allen Jazz Band (with Phil Mason on cornet and at the Edinburgh Jazz Festival) and a also a few recordings from bands performing on the Island of Bute. The recordings were made in the audience with high quality crossed pair mic feeding high quality tape recorders and the natural sound is very good indeed'. Laurence has converted some of the tapes to digital and these and the rest of the tapes he has passed to the Edinburgh Jazz Archive. One of the Dave Paxton recordings he has sent to us, we are playing it here (depending on your computer, if you get no sound you may be asked at the top of the page to allow the music to play). 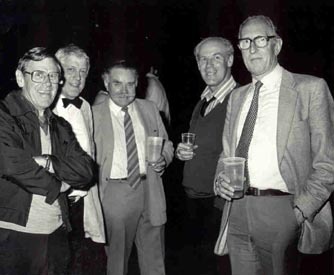 Alastair Clark's Obituary tribute to Bob (The Scotsman, August 1998) stated that their partnership "was a particularly symbiotic and fruitful one, for Paxton, like Bob, felt that the creative apogee of traditional jazz had been reached by the Armstrong Hot Five and Seven groups". Dave continued to play with Mike Hart and various other combos and performed at the Sacramento Jazz Festival. Dave with Sammy Lee, the Fireman’s Club, Edinburgh, 1982. 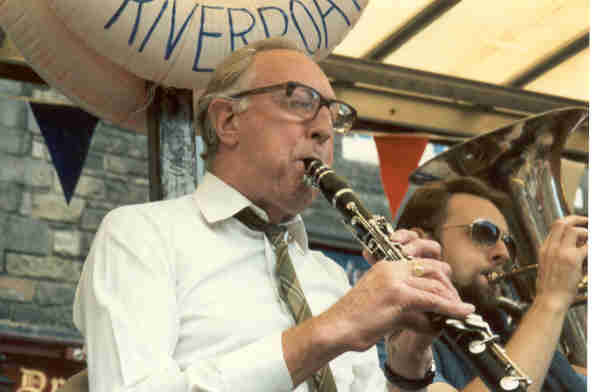 When Al Fairweather eventually returned to Edinburgh, Dave played with Al's band and subsequently with Jim Petrie's Diplomats of Jazz . 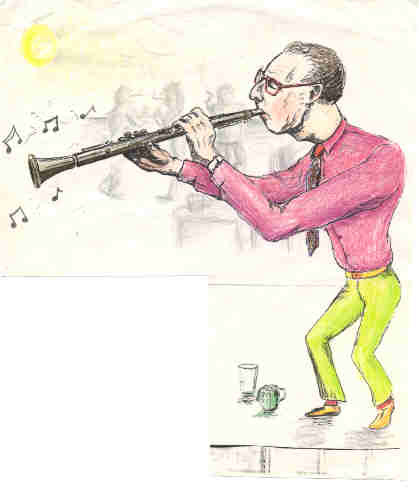 Sandy Brown's 'McJazz Manuscripts' biography recalls the time when the two clarinettists rented a bothy in the Pentland Hills (south of Edinburgh) where they played 12-bar blues duets non-stop for a week! (This tale may, of course, be apocryphal). David passed away peacefully at his Edinburgh home on April 19, 1993, aged 67. His cremation at Warriston Crematorium, Edinburgh on April 22 was attended by his family, friends, and many members of the local jazz fraternity some of whom provided a suitable jazz accompaniment to the service where three readings were given, one of which was by his old friend, Al Fairweather who himself passed on, a mere two months later on June 21. Dave Paxton will be remembered as a unique exponent of the jazz clarinet and an enthusiast with a great love of the music. He continues to be missed by his many admirers.